Pack two pairs of skis in this Salomon Ski Bag which has a zip-up expander increasing the length of the Salomon Extend 2 Pairs 175+20 Ski Bag by 20cm for versatility. Skis waxed, edges sharp, the magnetic attraction of the mountains calling... Pack your skis in this Salomon Ski Bag which transports two pairs of skis. Its zip-up expander increases the length of the Salomon Extend 2 Pairs 175+20 Ski Bag by 20cm for travel versatility. With this Double Ski Bag, you'll never be in resort wishing you'd bought your fat skis for an unexpected powder day again! Simple and convenient, the Salomon Extend 2 Pairs 175+20 Ski Bag is accessed via a full length zip opening. Volume adjusting external compression straps allow the Ski Bag to be cinched in when you're only bringing one pair of skis, or let-out to accommodate the packing of clothing in the double Ski Bag. The Salomon Extend 2 Pairs 175+20 Ski Bag features a double webbing shoulder strap for carrying around the airport and in resort, and a top haul handle to aid manoeuvrability at the outsized luggage desk. Complete with full length padding to protect skis and bindings in transport, and a reinforced base that resists friction for long-term durability and increased stability. The Salomon Extend 2 Pairs 175+20 Ski Bag's waterproof fabric interior prevents melted snow on skis escaping into other luggage, the waterproof exterior offers further protection from external elements. This Salomon Ski Bag allows the option to bring both powder and piste skis, allowing the selection of the best kit for the conditions on the day. Or, share the Salomon Extend 2 Pairs 175+20 Ski Bag with a partner or friend, and split the cost of ski carriage. Simple, yet protective, this Salomon Ski Bag will transport your skis to the snow with ease. 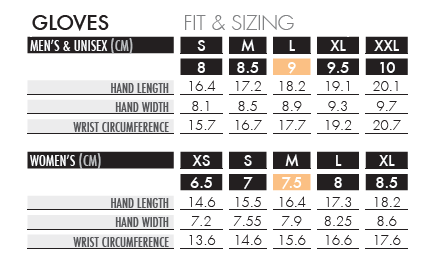 Salomon Glove Sizing Chart in cm.